For a long time, I‘ve been a student of the elements. These primary components of life, both physically and metaphorically, have a lot to teach. In fact, I took my very first astrology class to learn more about them and then found myself hooked into being a student of the stars as well. The elemental lessons of the last few weeks have been primarily about water. 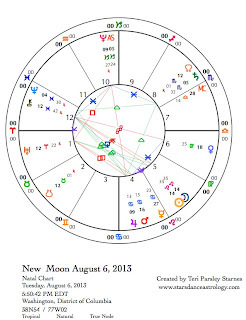 The New Moon in Cancer* began the flow, then a Grand Water Trine made sure that flow did not stop. There have been ebbs in intensity (of course, it is water after all) and we experienced a beautiful Grand Sextile last week that matched water with earth’s solidity. In the midst of water’s influence, the intention I’ve been following—inspired by Cancer—is to find, heal, and reside in the home of my being. In my place of refuge, emotional experience has more room to just be. Water seems to like that. I am taking away lots of insights about water from this lunar cycle that ends on August 6. One that stands out is that the emotional realm of reality is complex. My every perception is colored by emotion, yet not every emotional message is actually helpful to my health, my intentions, or my relationships. I’ve learned I need discernment when I’m getting an emotion message. Emotion, like mystical experiences, can convey profound and universal truths. And emotion can be very personal and dependent on simple things like how much I slept the night before and what I ate for lunch. Yet, I think the way to learn emotional discernment isn’t by bottling up feelings or deemphasizing their importance. That would be like living without a piece of my soul. This soulful search for emotional wisdom continues in the next lunar cycle; indeed we could say that in many ways it has only begun. Although the energy and intention of the next New Moon will be illuminated by Leo’s fire, the big water energy of Jupiter in Cancer is felt strongly this month as this planet opposes Pluto and squares Uranus. The Grand Water Trine of Jupiter in Cancer, Saturn in Scorpio, and Neptune in Pisces still reverberates through the New and Full Moon charts. I invite you to become a student of the elements too. For the Leo lunar cycle, fire is present along with water. Questions to explore could be: How do water and fire interact? How can these elements co-exist? How are they similar? What do they need from each other? What do we notice in ourselves as these two elements seek to find expression? Sunday, August 4. Mercury retrograde cycles don’t really end until Mercury gets past the degree where it originally turned retrograde. Today is that day for the most recent cycle. Mercury turned direct on July 20 but you may have noticed that it hasn’t felt that way. After today, Mercury moves clearly ahead and we get to apply what we’ve learned about communicating through and about our emotions. This comes in handy because the Moon in Cancer brings tenderness and we may need to communicate with others who are feeling tender too. Although the Moon’s in water, the Sun in Leo is very much about fire today. The Sun trines Uranus in Aries. We feel the boldness of fire’s passion to embrace change. At the end of the day (Central Time Zone), the paradox between water and fire is felt strongly. Lean into this feeling and invite a new understanding. Monday, August 5. Try on the Leo energy for size today. Tomorrow the New Moon in Leo begins a whole new cycle of intention and mindfulness. Begin to notice the effects of the Sun on you, on others, on the green world, on the animal world. Really, there is no being on this Earth who is not impacted by the Sun. The Sun, as ruler of Leo, is the celestial body that mirrors to us what this sign is all about. Today, it might be interesting to think about the nature of the Sun’s fire—its generosity, its command of our attention, its intense heat, and its central importance to our lives. Then contrast this fiery energy to the deep waters of Saturn in Scorpio. The Moon in Leo squares Saturn. You may notice a raincloud has come to ruin your perfect day. But there is a gift hidden in that raincloud. What is it? 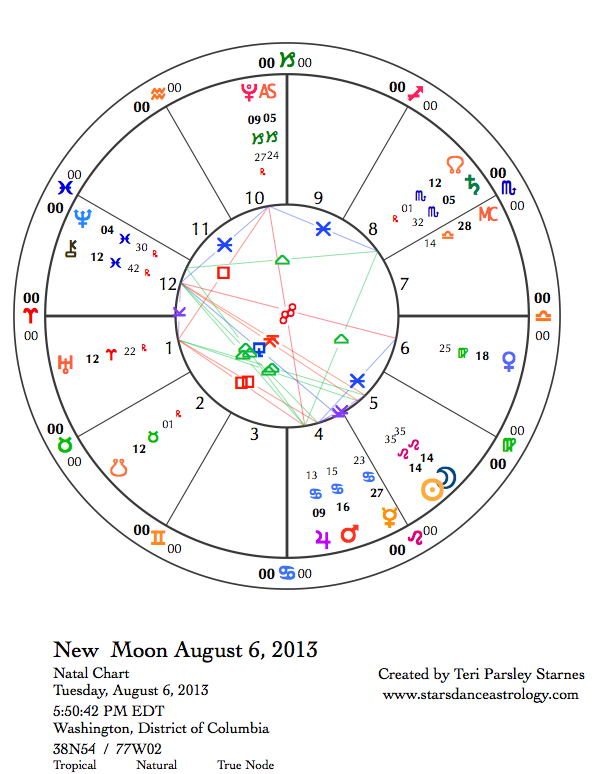 August 6—New Moon: Dreaming. Did you discover anything about the Sun yesterday? Astrologically, the Sun represents our potential gifts—the light we have to share with others. Through looking at the Sun in our charts, we learn about the challenges we have in freely expressing these gifts. The Sun is generous; its light is free and abundant. Most of us have a lot to learn about living as wholeheartedly as the Sun models for us. Yet, that light is there in everyone. For the next few days, during the New Moon phase of dreaming, begin to tap into the light you wish to share with the world and the life you wish to honor with your generosity. In both the New Moon and Full Moon charts, Jupiter plays a starring role. It opposes Pluto at the New Moon and squares Uranus at the Full. Jupiter in Cancer encourages the belief that emotions should help us in making choices. This is both true and a bit dangerous. As I wrote in this week’s introduction, discernment is helpful when listening to messages with strong emotional content. It is all about balance and finding the still place to listen to intuition. With that kind of practice in place, the opposition of Pluto and Jupiter invites an integration of wild hope with steel-eyed realism. This is real strength. But if we can’t accept our imperfections, the world will give us bad guys to fight. The battle feels like it is about survival. Some of us will be fighting to protect the people or values most precious to us. However, the intensity of this opposition is mitigated by the other water signs. Saturn in Scorpio is rooting for all of us to do the soul searching that leads to self-forgiveness. Neptune in Pisces asks us to surrender control and learn to have faith in a larger story. Remember these helpers if you find yourself in a battle of wills. Wednesday, August 7. After conjoining the Sun yesterday with a new cycle beginning in Leo, the Moon enters a void-of-course period until late in the evening (Central Time Zone). If the New Moon phase is a time to step between the worlds to vision about current intentions, then today feels even more potent for that kind of work. Jupiter opposes Pluto for the first of three times that it will do so over the next 9 months. Our intentions for the Leo cycle are supercharged with this energy. Commit to the process of empowerment. With Leo’s wholehearted fire and Jupiter’s expansive water, we take a step deeper into the soul work of Pluto. Something is ready to transform, not only for each of us individually but for all of us collectively. Thursday, August 8. Devotion and service help anchor the intention to live more fully in this world. Wholeheartedness is strengthened when we dedicate our gifts. Virgo can be felt as constricting to Leo’s desire to have free reign in creative efforts. Rather than push away the Virgo desire for pragmatic actions, invite in the collaboration of spirit with reality. This could be a very useful day. Mercury entering Leo inspires creativity. The Moon’s contacts are all about taking the next concrete steps to manifest those ideas. Friday, August 9. Concrete steps continue from yesterday into today. This can feel very satisfying. Venus and Mars are conspiring to bring pleasure and energy to our work. And don’t limit your concept of what work is. See how broad you can make the idea of what you do with your life as your work. This could be your actual job, your devotion to your Sun-powered gifts, or your daily actions that ground you in this world. August 10—Crescent Moon: Beginning. If you found yourself responding positively to the desire to be more productive the last couple of days, you are well-positioned to reap what a Libra Moon offers: a sense of beauty and balance. The Crescent Moon at sunset tonight will be close to Venus. If you can, make a date to view this pairing. Take in this beauty as inspiration for your journey through the Leo lunar cycle. Venus and the Moon are able to sparkle in the sky because they are illuminated by the Sun. What if the Sun decided his gifts were not worthy? What if the Sun decided to hold back on offering her light freely to others? Why would we deny our own solar natures when so much of the sparkle of the world depends on them? The Moon not only inspires us to live in beauty and balance, but it triggers the tense aspects between Jupiter, Uranus, and Pluto too. This tension begins today and carries through to tomorrow. So, doubts, obstacles, and challenges are present. Perhaps we can take that as a sign that our light is even more valuable to transforming the world.